As a kid, one of the few foods I didn’t like, was pumpkin pie…and other than carving one, I didn’t know there was much else to do with this gourd. Boy did I have a lot to learn! The Great Wheel of Color…..
No coincidence that our chakras are these colors and that eating foods associated with the color of each chakra can help balance them. This chart will be super helpful when putting together your own chakra salad! Using these colors/foods as a guide will not only be great for your body, heart and soul, but also will end up making a really pretty presentation! It’s one thing to be watching calories and another to live on a plant-based diet but when you combine them, you obviously create a smaller list of foods that you are comfortable eating. For years I struggled with the potato. I absolutely love potatoes (any way and every way) but with the whole anti-carb hype, anti-“white” hype, I limited them for quite a while, reserving them for days of indulgence. I admit I dreamed about an optimal nutritional plan that would include the potato, but all the “experts” made me pessimistic about the reality. Then, a dental woe temporarily caused me to further limit the foods I could comfortably eat and I had to include baked potatoes. In fact, for a few days, I was eating them more than once a day. I was so happy. And because eating was challenging, the scale dropped, no doubt because my calorie intake was lower than usual. This prompted me to reconsider the white spud and I have been eating them a few times a week, ever since. And the scale continued to reflect weight loss. What I found was that by continuing to keep my calories at about 1500 a day (I approximate all this) I can still get in all my nutrients, keep from being hungry, sustain the energy I need for my athletic day AND enjoy my potatoes, too! We all know that sweet potatoes are a great food for everyone and they are still a smarter choice, but for me, nothing compares to the plain old baked potato. If I am feeling more indulgent, I will cut them up and toss them with some olive oil and kosher salt and grill them in a tin. That side dish is always a treat and goes a long way when feeding a family or company. So while there is no consistent info on the potatoes nutritional value (because no 2 spuds are quite the same) it is enough to know that a medium sized one is somewhere around 160 calories, provides about 1/4 of your days needs for all important potassium, about half your days needs for Vitamin C, and about 1/3 of the vitamin B-6 you require a day. It is cholesterol free, fat free and eaten with the skin, gives you close to 5 grams of fiber, which is a lot for one food! Remember, fiber is not only necessary for a healthy digestive system, but also helps us to continue to feel full well after a meal is over. Though the potato is a high carb food, it provides about 5 grams of protein as well. We need to stop thinking of foods as just carbs, or just proteins and understand that foods are a combination of nutrients and we need them all! 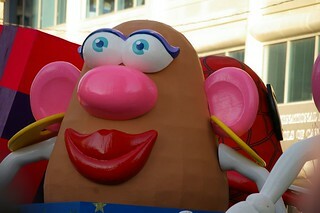 Clearly is you are on a high protein low carb diet, a potato will give you way too many carbs. I am not a big fan of those diets, personally for a bazillion reasons, but that’s what works for me and I am a big fan of choice. Yes, I am sad about King James leaving our Miami Heat. I am not bitter. Like I said, I am a fan of choice and I wish him and his family well, though I will miss him as he has been my favorite! Here in South Florida mangoes are the happening fruit. They are falling from trees everywhere, including our own backyard. Whether you like to peel them and eat them over the sink, cut them in half and scoop them out, (our favorite way) slice them or dice them, they are at their sweetest right about NOW. They are awesome refrigerated, grilled (yum) or just the way they are! You can use them in smoothies or as topping for cereals and salads, or make them into a mango salsa. 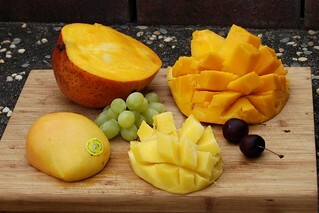 A cup of mango is just 100 calories, fat free, cholesterol free, sodium free and supplies you with 3 grams of fiber. That same one cup provides 100% of our daily Vitamin C requirement! My experience is that mangoes are at their best when they have JUST fallen from a tree. Be careful when you pick them in a store. They should be slightly soft to the touch or the flavor may be off, which gives mangoes a bad rap. Posted on July 2, 2014 Categories Food1 Comment on Mango Bango! Is Myth #2 Affecting Your Weight Loss Goal? Last week I registered for The Food Revolution Summit, a free, online series of lectures by some of the most well respected professionals in the field of nutrition, longevity and health. Thus far, I have gotten to tune into some awesome speakers, including Dr. Dean Ornish, Dr. Mark Hyman and Dr. Caldwell Esselstyn, who all spoke about food as medicine. Regardless of who spits it, the message is the same. We can prevent and reverse most all diseases of “affluence,” by avoiding the foods that are making us sick and substituting them, instead, with a wide variety of colorful plant-based choices. 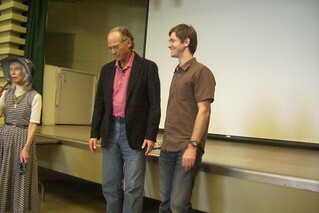 Always hungry for more information on this topic, I am thankful to John and Ocean Robbins (of the Baskin-Robbins family) for putting together such a comprehensive summit and making it available to the public, free of charge. But I want to go back to the myths that are sabotaging our weight loss goals, and myth number 2 is one that I am guilty of, but definitely paying more attention to, now. The myth is that healthy oils are good for our diet. Healthy oils are good for us, but it turns out, the quantity at which they consume them, is negatively impacting our weight loss. It is estimated that Americans are eating up to 700 calories a day in healthy oils. If, like me, you make your own healthy homemade salad dressing, you will be using a decent amount of olive oil, right there. 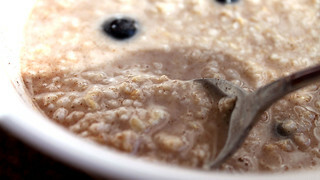 At 120 calories in a tablespoon, we can all see where the calories might add up quickly. So you take this huge, gorgeous salad, filled with all the colors of the rainbow and very low in calories and you add a few tablespoons of olive oil and boom, you just increased the calories by a few hundred. Then, if like me, you are using olive oil as a base to marinate foods, in my case veggies and tofu, it is easy to see how the numbers get out of hand. Dr. Furhman makes a great suggestion in that you can saute onions, garlic, etc., in a little bit of water and get a very similar outcome. If you are using tomato sauce in your dish, you can use that to saute vegetables. Sunday, instead of grilling my veggies, I cut up the eggplant and tomatoes (from Erica and Jeff’s garden–thank you) and did the same with some zucchini, onions and mushrooms from my fridge. I used the very tiniest amount of oil (like one teaspoon) and then added some water as needed–I added one veggie at a time and then added just a few spoons of tomato sauce and let everything simmer down, covered. The veggies came out great. Last night I added a few strips of Beyond Meat chickenless, chicken (in the Publix freezer aisle near the Gardein products) to the leftovers and had a low calorie, high protein, and extremely satisfying meal. No one is saying you can’t have your healthy oils. They are in fact healthy. Healthier, though, is being at your ideal weight. Cutting back on some of the oil, and getting those healthy nutrients through a few walnuts tossed on your salad, will help bring you closer to your goal! AWARENESS is everything. Once we are aware of anything in our lives, we are able to make choices that can lead us closer to our goals, be they on the scale, in the gym, or in all aspects of life. I will be at the gym today at 10 to sub for Ellen who goes back to the doctor for a follow-up tomorrow. I will be at the gym for my own 11:30, 6 and 7 o’clock classes. See you there, or right here. Thanks for stopping by for a little dose of peaceandfitness. To Peep, or Not to Peep. That is the Question. Yes, the gym is open today and yes, I will be there to teach my regularly scheduled morning class. See you there, or back here. Posted on April 16, 2014 Categories Food2 Comments on Make Mine a Double! Did you know that popcorn without any oils added is a 100% whole grain food and one serving provides more than 70% of our recommended daily dietary need? Along with the high fiber it provides it also contains a significant amount of the class of antioxidants known as polyphenols and while it should never replace fresh fruits and vegetables, it actually has 2-3 times the amount of those polys as compared with corn, or any fruit. If you want to keep your popcorn free of animal products, buy the bottle of kernels and pop it in a machine, or just a pot with a lid. Locally, Publix brand of microwaveable popcorn is also free of animal products. If you are watching your calories, you will want to limit your serving size and avoid most toppings, like butter, oil or grated cheese. I love my popcorn with nutritional yeast which gives it a cheesy flavor. Of course tomorrow there will probably be another study that tells us all the bad things about popcorn. But that’s a topic for another day! The best thing about today is that is THE LAST day of winter. Hold on, cause spring is about to ….spring!